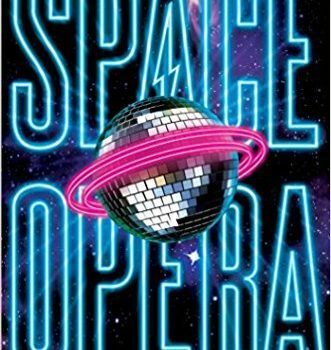 Space Opera, Catherynne M. Valente (Saga 978-1481497497, $19.99, 304pp, hc) April 2018. Like its acknowledged inspiration, The Hitch­hiker’s Guide to the Galaxy, Catherynne M. Valente’s Space Opera is something of a Christmas tree: a fairly generic template adorned with so many glittering ornaments and exuberant sentences careening along like beaded garlands (some of Valente’s more ambitious sentences sound as though they need bongos for backup), that pretty soon the plot itself begins to seem like just another ornament. That is probably just as well, since how many of us remember the actual meandering plot details of Douglas Ad­ams’s epic, at least compared to his overpacked, Where’s-Waldo canvas of alien critters and bizarre civilizations? Valente takes up Adams’s implicit challenge with an even more crowded universe and with an unflagging, nonstop manic humor that hits far more than it misses, offering endless capsule descriptions of worlds ranging from the impossibly sweet Litost (“the kind of world a child would design if that child had never been harmed by the world in even the smallest way and wanted to be a rainbow when it grew up”) to the cemetery-covered world of Fenek, where virtually all life had been infected and turned into rotting zombies by the intelligent virus called the Voorpret. 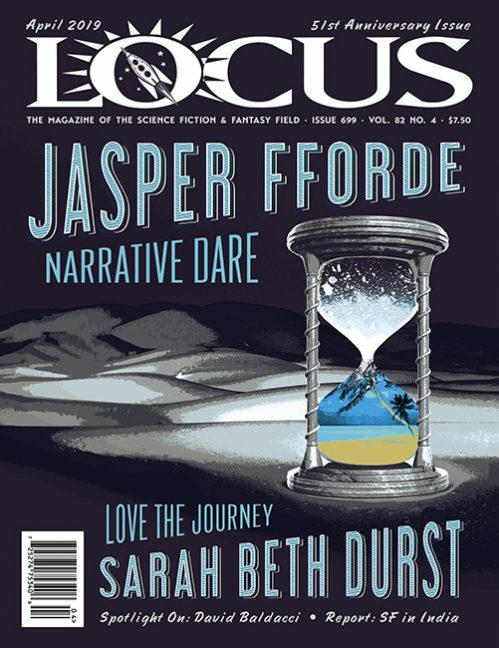 At times her inventions seem to echo the satirical alternate worlds of Ursula K. Le Guin’s Changing Planes as much as the waggish inven­tions of Adams, but that’s not a bad thing at all. The term space opera has nothing to do with music, of course, but a number of writers have thought that maybe it should. 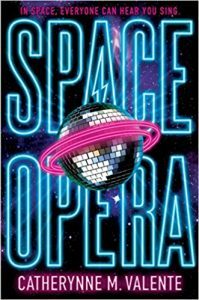 When Jack Vance wrote his novel Space Opera back in the 1960s, he made an actual opera troupe the center of the story. Valente chooses a washed-up rock group called Decibel Jones and the Absolute Zeros, who find themselves recruited as Earth’s sole representa­tives to the Metagalactic Grand Prix, a sort universe-wide Eurovision Song Contest with similar origins: just as Eurovision was conceived to help culturally unite Europe after WWII, the Grand Prix was a follow-up to the devastating Sentience Wars, which “engulfed a hundred thousand worlds” a century earlier over the question of what should and should not be counted as sentient species. (Amid the endless barrage of jokes and wisecracks, Valente manages to raise some pretty compelling questions.) Now, the song contest is used to at least partly address this question: only the contestants who end up dead last in the competition face having their entire world an­nihilated. Needless to say, this places some pressure on the Absolute Zeros, who were chosen – not by fellow humans but by aliens who suddenly appear simultaneously throughout the world – from a list of possible candidates that includes Yoko Ono, Insane Clown Posse, and the Spice Girls. To make matters worse, they seem to have no good ideas at all of what they should sing. As this might suggest, Valente’s humor, despite its galactic setting, is firmly grounded in Earthbound pop culture. At one point the humans, who are given virtually no chance of avoiding annihilation, are told that “the Carpenters alone pretty much disqualify you” from being recognized at sentient, while the winning song from that zombie-making intelligent virus was “I Can’t Get No Liquefaction” (is it a spoiler to reveal one of the best jokes?). A society of AIs manifests itself in the form of Clippy, that maddening “office assistant” paperclip from old Windows versions, while the flamingo-like alien who appears to Decibel Jones is called Road Runner from the Chuck Jones cartoons, the interstellar ship from the aliens known as Esca is called “Cake in the Rain” from the ancient Jimmy Webb song, and Decibel Jones himself seems pretty strongly influ­enced by David Bowie, whose glam-rock sensibility underlies much of Valente’s novel. 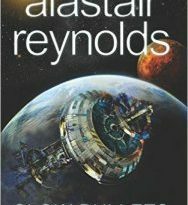 While there is a bit more traditional character development in the backstory of the Absolute Zeros and its members, that’s not really what Space Opera is about, any more than it’s about the machinations surround­ing the song contest itself, despite various hints of treachery, backstabbing, and bribery that give the last few chapters a gloss of traditional suspense. What it’s really about is Valente having fun with the sheer possibilities of absurdist invention, of SF as gonzo late-night stand-up improv, and of music’s power to either change the universe or perhaps change nothing at all. Fortunately for us, it’s about as much fun to read as it must have been for Valente to write.